Situated near the administrative centre of Astana, this hotel offers free Wi-Fi. Centrally located, it is 2.5 miles from the Kazakhstan Central Concert Hall. All air-conditioned, non-smoking rooms at the Hotel Korsar come in a classic style with soft colours and elegant furnishings. All feature a flat-screen TV with satellite channels, telephone and work desk. Guests at the Korsar Hotel enjoy a fresh, rich breakfast buffet every morning, which can also be served in guests rooms. The restaurant serves European and Kazakh cuisine. Facilities at the Korsar include a drinks bar, 24-hour reception, currency exchange and laundry service. 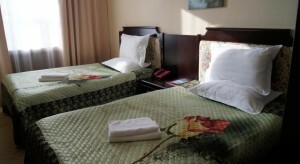 It is within walking distance from several shops and restaurants. The Alatau Sports Palace is a 4-minute drive from the Korsar Hotel Astana. Guests can take a relaxing walk through the peaceful Presidential Park, just over one km away.